Heavy rains are soaking the tri-state area as winds whip lingering debris from Sandy and scattered power outages are reported across the region. Airports were reporting delays early Friday as the remnants of a storm system that produced heavy snow in the Midwest moved toward the East Coast. Mass transit was not affected. Winds gusts of more than 50 mph were recorded in some spots, bringing potential to down power lines. While the heavy rain was expected to taper off by noon, meteorologists said the strong winds were likely to linger until Saturday, though they were expected to diminish in intensity. High wind watches and warnings are in effect for most of the region through early Friday afternoon. Scattered outages were reported across the tri-state area early Friday. Jersey Central Power & Light was reporting more than 5,500 customers without power, mostly in Ocean County. Anywhere from a third of an inch of rain to more than an inch and a quarter is possible. Some flurries are also possible. 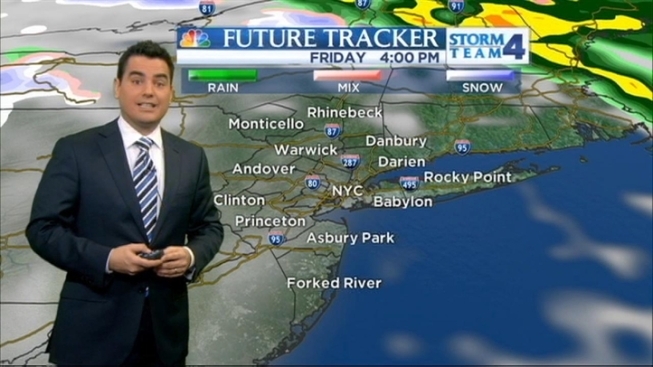 Temperatures are expected to peak in the mid 50s Friday before plummeting over the weekend. Saturday temperatures are not expected to make it into the 40s, while meteorologists forecast a high of 41 degrees Sunday. Christmas Eve looks mostly sunny, but a weak storm is expected to move in overnight that could bring some parts of the area light snow just in time for Christmas. Christmas Day is expected to turn partly sunny after a gloomy morning with temperatures in the high 30s.